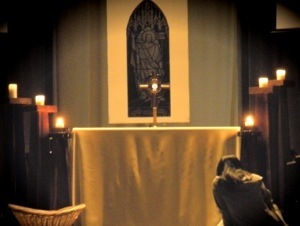 Every Wednesday at 9:00 PM, we will provide a time of quiet prayer which then leads into Exposition of the Blessed Sacrament. Come and adore! The Blessed Sacrament Chapel is available for private Adoration of the Blessed Sacrament whenever the Newman Center is open. It is located at the north side of the main chapel.